Absorbent Cotton Wool I.P. is made using premium grade of cotton and is free from dirt. These Absorbent Cotton Wool I.P. are available in different weights and in natural white color with less naps. 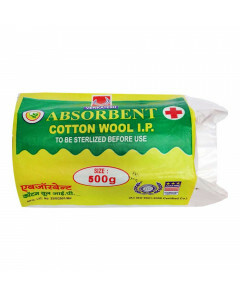 Highly reliable and durable, these absorbent cotton wools are in adherence with I.P. standards. Features of Absorbent Cotton Wool I.P. :* Made from 100% natural cotton. * Highly absorbent. Available in natural white color.